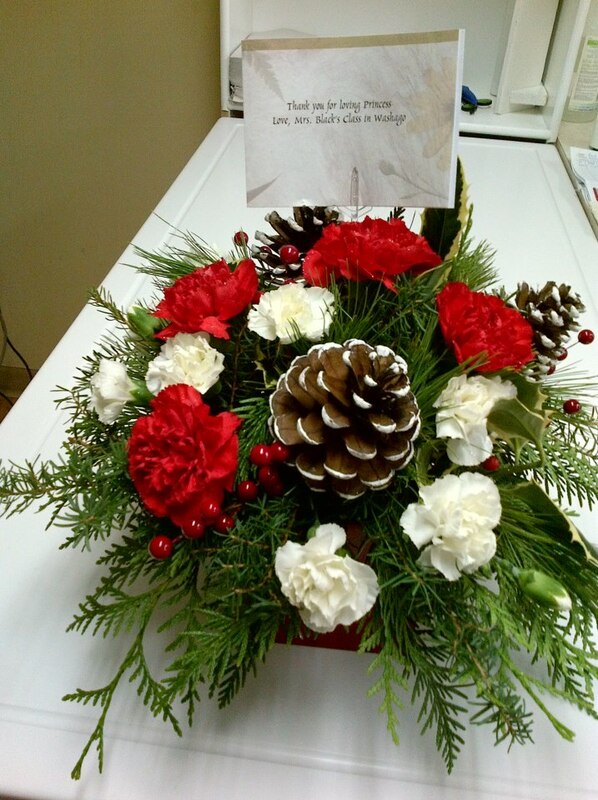 On behalf of the class, I sent flowers to the Boyne Veterinary Clinic (where Pattie works as a Veterinary Technician), to thank their staff for everything they did for Princess. 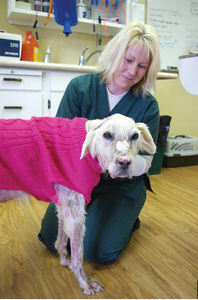 From beginning to end, the team at the clinic demonstrated great compassion and gave Princess the best care possible. On Monday, when it became apparent that Princess was slipping away, five members of the clinic team stopped what they were doing, sat together around Princess' bed on clinic floor, and kept vigil as she passed. We knew this had to be very hard for them. 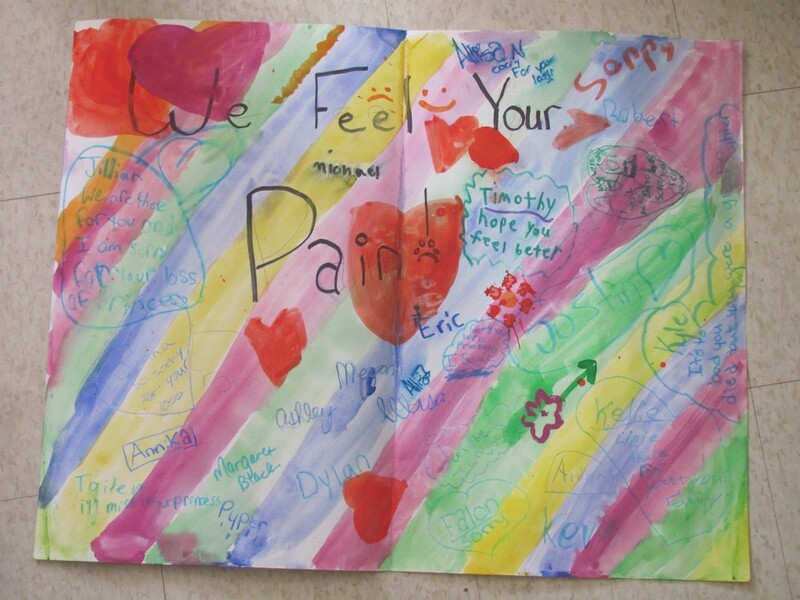 Our card to clinic staff read: "Thank you for loving Princess"
The day after Princess passed away, two packages from Pattie Dawson arrived at our school. 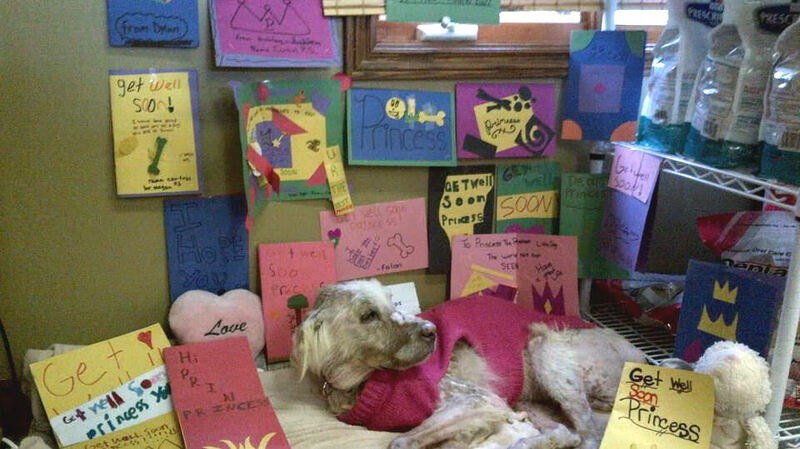 The previous week, when Princess seemed to be progressing well toward good health, Pattie had printed a personalized note of thanks and a cute picture of Princess wearing reindeer antlers for each student in our class, and each student in Mrs. Park's class who had made a Get Well card for Princess. Mrs. Park and I decided to wait a few days before distributing these gifts, to give students a chance to adjust to Princess' passing. We gave Pattie's notes and pictures out this morning. 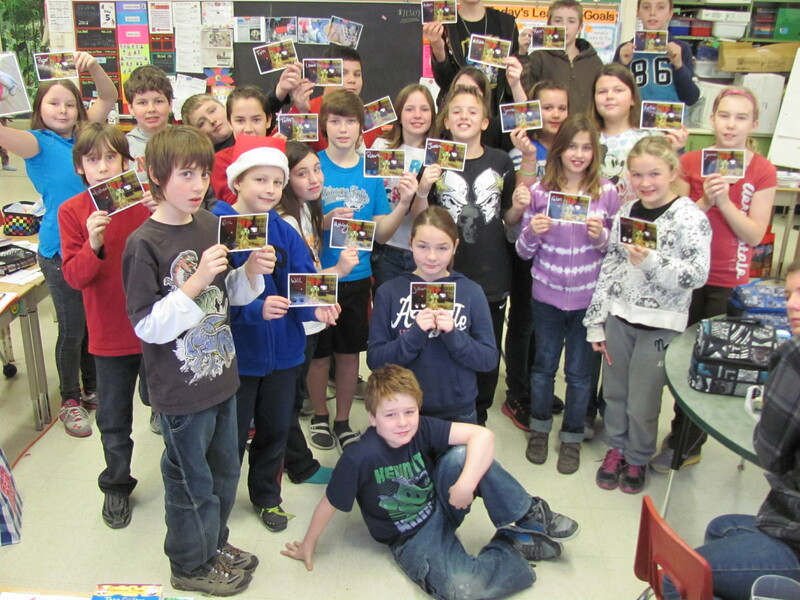 THANK YOU PATTIE, from about 40 smiling faces at Rama Central Public School! What a kind gesture and wonderful keepsake!! 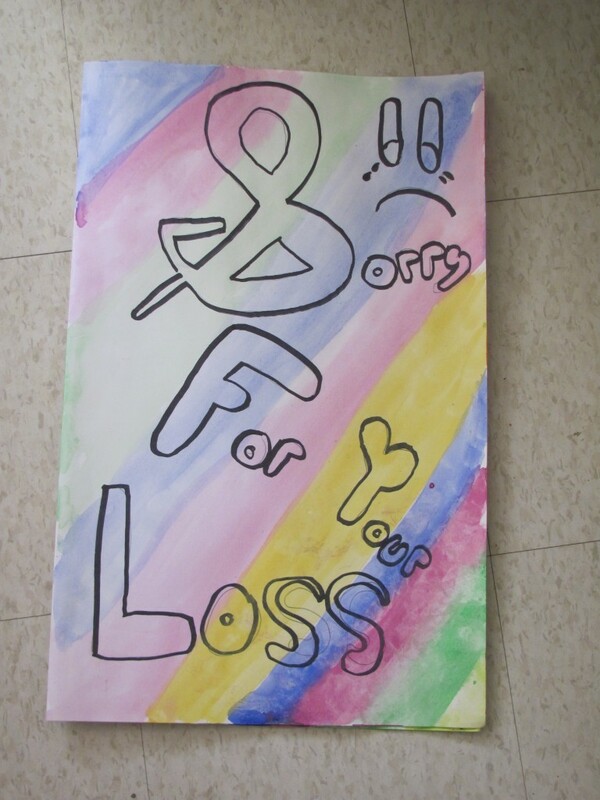 Thank you for visiting our class BLOG. If you have any questions or comments, feel free to e-mail me (Margaret Black): mblack@mail1.scdsb.on.caor to add a comment to this page. Six weeks ago, a dog was found in a ditch, covered in filth and too weak to walk. She was picked up by a member of the Alliston & District Humane Society and taken to a nearby veterinary clinic. 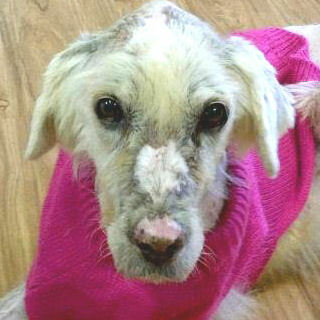 The dog, estimated to be about ten years old, spent the first week fighting for her life. Over the next five weeks, “Princess” became stronger and quite attached to her caregivers, following them everywhere they went. 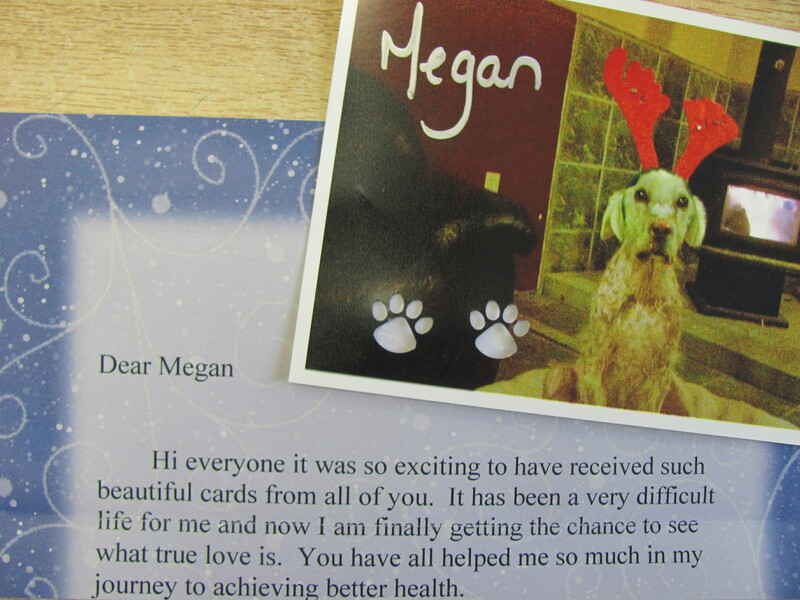 She also showed an affinity for other animals, children and meeting new people. Medically, Princess continued to have her ups and downs, usually eating well and growing stronger, but occasionally losing her appetite and growing weaker. This past weekend, Princess experienced the best two days of her new life. She ate well and, on Saturday morning, the dog that could barely stand six weeks ago took a spontaneous run around her new family’s back yard, head held high and tail wagging. 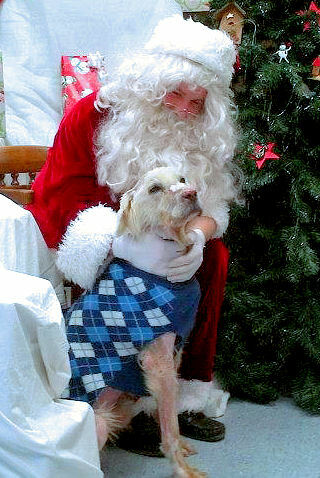 On Sunday, Princess made a guest appearance at the Alliston animal shelter, to have her picture taken with Santa. In the picture, Princess is responding to a massage from Santa with a look of sheer pleasure on her face. On Sunday night, Princess’ health took another turn for the worse. She stopped eating and was in obvious discomfort. 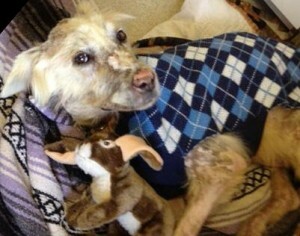 Her foster mom, Pattie Dawson, rushed her to the veterinary clinic on Monday morning. Through the day, day Princess became progressively weaker and appeared to experience increasing pain. On Monday evening, surrounded by the members of her new family, Princess passed away of multiple organ failure... the consequence of years of neglect and abuse. Although Princess’ sudden and unexpected passing is very sad for her caregivers, I can’t help but feel somewhat relieved and happy for her. Over the past six weeks, Princess experienced love and proper care, likely for the first time, she appeared to enjoy her new life and family immensely, and now she is no longer sick or in pain. 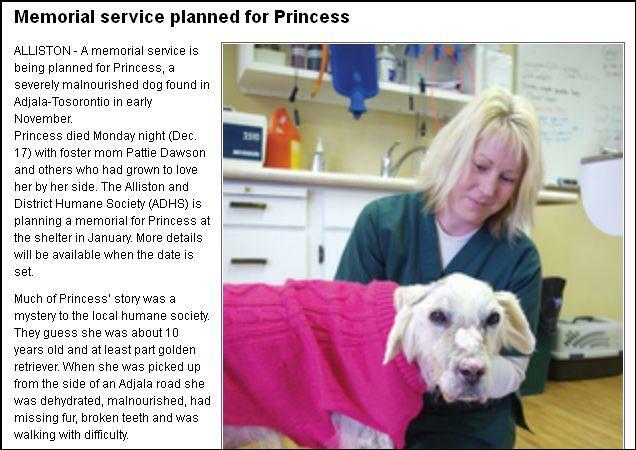 How much sadder would Princess’ story have been if she had died alone, in a ditch, six weeks ago? I continue to be very proud of my students and I hope they will come to understand that their efforts on behalf of Princess were not in vain. Through their cards and fund-raising efforts, they sent a clear message to others that animal abuse is not acceptable, they learned that even kids can make a huge difference, and they helped to make the last days of an abused dog’s life happy. 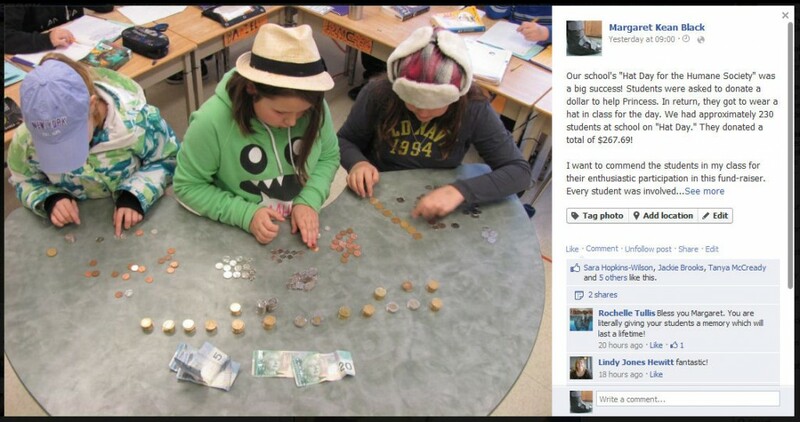 Our class raised $713.09 to assist with the cost of Princess' care, through a classroom coin drive and school-wide "Hat Day for the Humane Society!" Our financial contribution has been forwarded to the Alliston & District Humane Society, to help pay Princess’ outstanding veterinary bills. 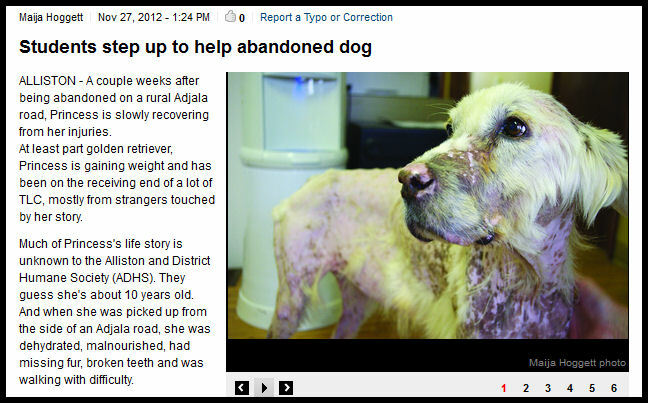 If there is any money left over it will be used to support the animals in the society’s shelter. Pattie Dawson plans to visit our class in the New Year, to thank the students and let them know how much their financial and moral support meant to Princess’ caregivers. My daughter Emily (age 12) and I plan to represent our class at Princess' memorial. We will also travel to Alliston in the spring for the dedication of a new walkway, with memorial trees and plaques, around the two ponds on the Humane Society's property. 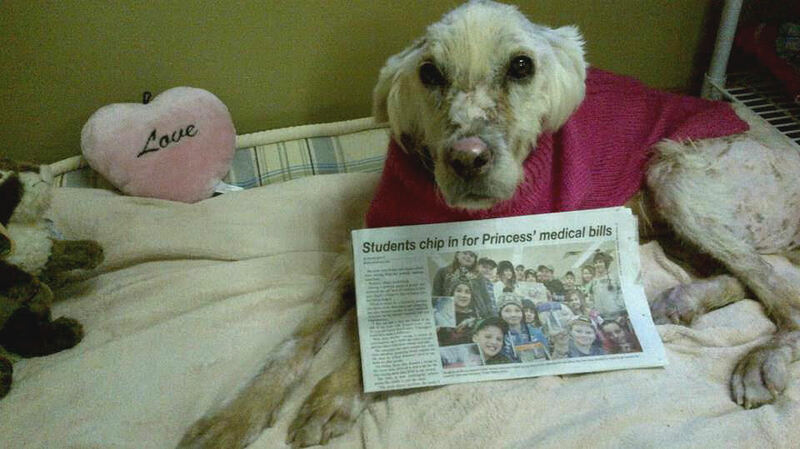 This walkway will be named "Princess' Path," in memory of the dog who touched thousands of lives with her story and inspired our class and others across Simcoe County to come together, via social media, to assist Princess and speak out against animal abuse. As Wendy Haugen, of the Alliston & District Humane Society wrote: "Sometimes it is not the ones who are here for a long time that touch us the most, but the ones who are so grateful for so little and here for such a short time." Thank you for visiting our class BLOG. If you have any questions or comments, feel free to e-mail me (Margaret Black): mblack@mail1.scdsb.on.ca or to add a comment to this page. Author Margaret BlackPublished on December 10, 2012 January 16, 2013 1 Comment on Character Ed. 101: Princess Thanks Us! If you read through the previous two BLOG posts, you will learn about our current Character Education project: providing financial support to an abused dog and moral support to her team of caregivers, in south Simcoe County. 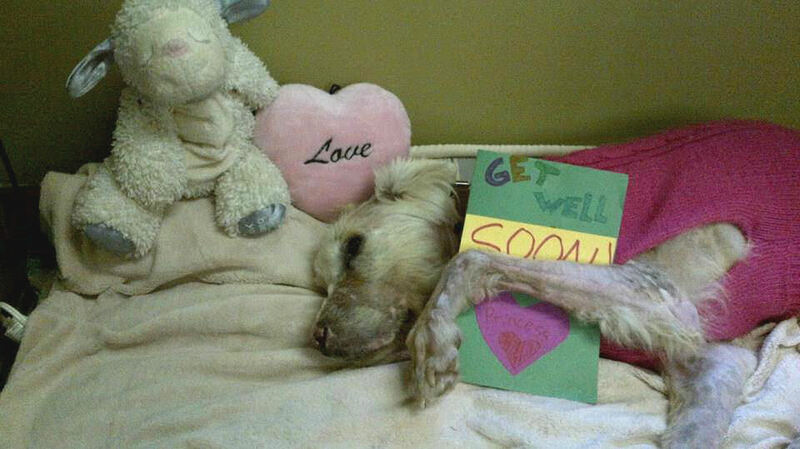 Pattie's caption: "I love looking at my get well cards. Thank you all :)"
Pattie's caption: "Sleeping like a baby with Jann Arden playing in the back ground! 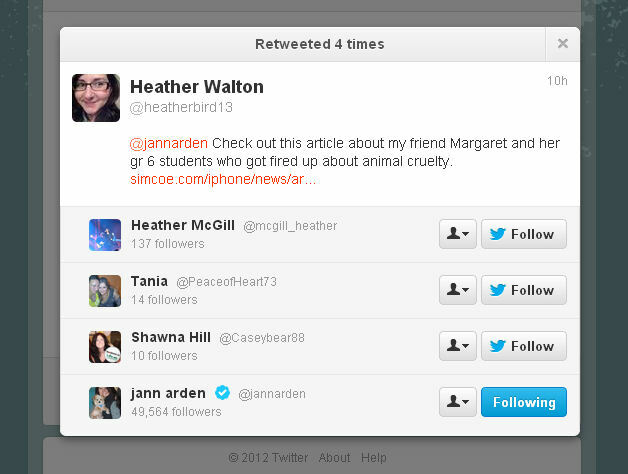 Life is good on another rainy day 🙂 xoxo"
Re: Canadian singer-songwriter and animal rights activist Jann Arden... A teacher friend of mine named Heather Walton follows Jann on Twitter. The other night, Jann posted a tweet about animal abuse. 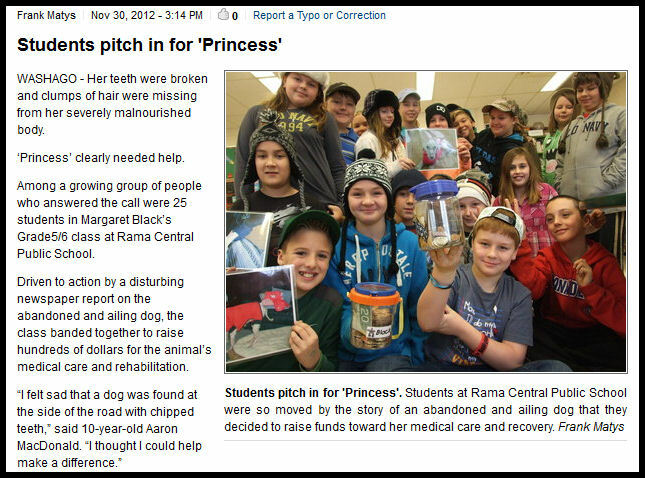 Heather responded by sending Jann a link to the Orillia Today article about our class' fund-raising efforts for Princess. Jann Arden retweeted that link to all of her Twitter followers. 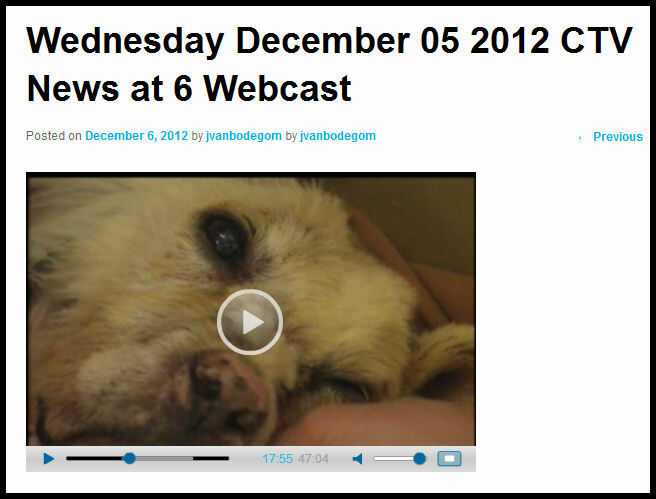 Now 50,000 more people know that our class stands up against animal abuse, and that even kids can make a difference! Pattie's caption: "I received a package in the mail today from Margaret Black's class 🙂 They made the newspaper too and wow they are so great! I can't wait to get to meet each one of you in the new year! Thank you xoxoxo"
Published on December 10, 2012 January 16, 2013 Categories Community Service1 Comment on Character Ed. 101: Princess Thanks Us! Author Margaret BlackPublished on December 1, 2012 January 16, 2013 1 Comment on Character Ed. 101 Takes on a Life of its Own! This week, "Project Princess" took on a life of its own! The press jumped all over the good news story that children want to make a difference. My class and I hope all this exposure will inspire others to donate funds for Princess' care, and send a message that animal abuse is NOT okay! Later that day, a reporter with Sunshine 89.1 FM radio called in response to the media release and conducted a phone interview with me for their news broadcast. On Wednesday, November 28th, a reporter from the Orillia Packet and Times newspaper called. She will be covering Princess' first meeting with my students, when the dog and her foster Mom come to my school, likely in January. 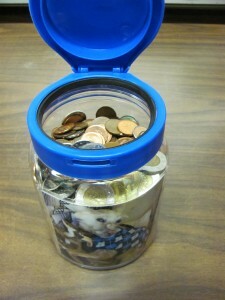 As of December 3rd, our in-class coin drive has brought in over $250. in donations. As promised, I will be matching my students' donations with $100. of my own. 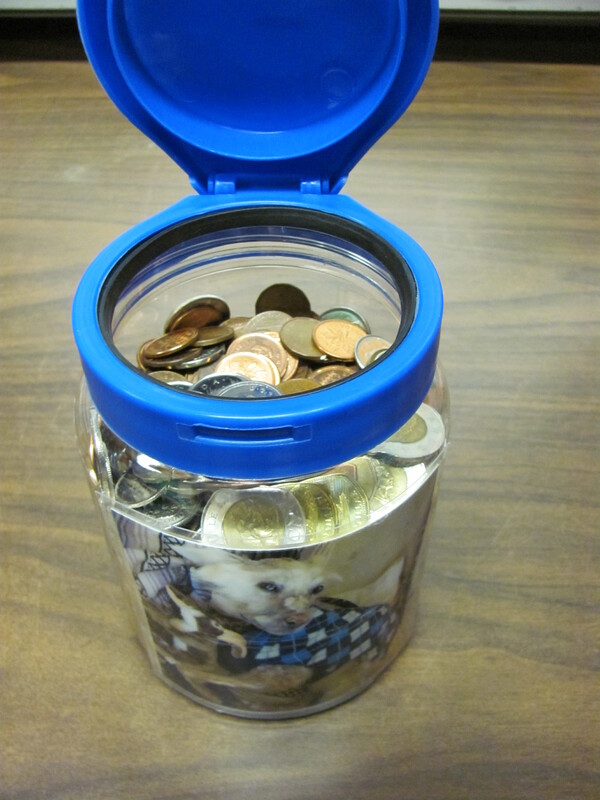 The coin drive continues until December 20th. I believe in leading by example, and that is what my students are doing with this project. This week they learned in a very tangible way that even 10 and 11 year old kids can make a difference. I am so proud of the way they have come together as a team to assist with and share a cause that touches their hearts. 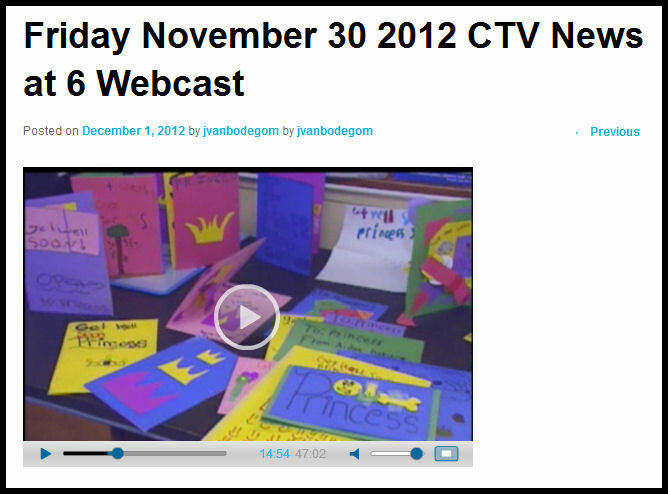 Princess' story was covered on CTV Barrie's evening newscast again this evening. Her story starts at 16:40 in the broadcast. Published on December 1, 2012 January 16, 2013 Categories Community Service1 Comment on Character Ed. 101 Takes on a Life of its Own!